Valley View Hot Springs in southern Colorado is so far from my home in Boulder that it calls for a visit of at least two nights and an appreciation that the journey can be as important as the destination. I had both during this three-day Martin Luther King Weekend. Valley View is a rustic clothing-optional resort at an elevation of 8,600 to 9,000 feet perched above the San Luis Valley where it abuts the Sangre de Cristo Range. The San Luis Valley is a huge alpine desert encompassing 8,000 square miles of Colorado and northern New Mexico. The journey of 185 miles from my home took a friend and me through amazing changes of scenery and weather. We started the trip by driving down the corridor between the Front Range and Denver. Soon the road climbs the mountains up to 10,000 foot Kenosha Pass, where it drops down into South Park, one of the largest of Colorado’s mountain valleys. Then, at 9,000 foot Poncha Pass, begins the 122-mile-long San Luis Valley. En route we encountered herds of elk, pronghorn, and deer as well as flocks of geese. Here below in South Park is a small part of the largest elk herd I have ever seen. 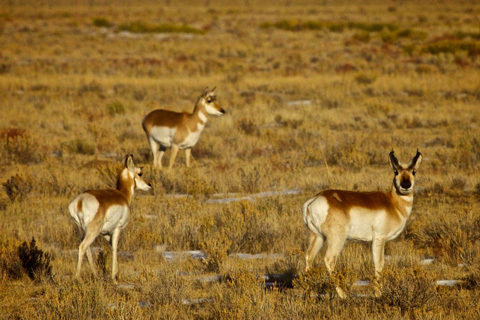 Four hours later the herd to photograph was pronghorns.